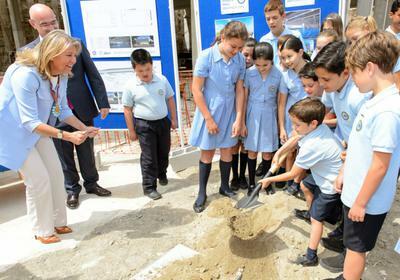 Aloha College was privileged enough to have in school the mayor of Marbella, Doña Ángeles Muñoz, and the President of Fundación Aloha College, Don Joseph Fay, to lay the Foundation Stone of their new building. It was a lovely event which included the ceremonial filling of the time capsule with a set of current coins, flags and newspapers of the day. Doña Ángeles and Don Joseph also signed the foundation document and place it in the capsule with our 2014 Yearbook. Some of their children attended the ceremony too and especially enjoyed the moment when the foundation stone was moved into the excavation pit to be covered with soil. Aloha College is very happy and proud to witness the formal initiation of this emblematic project, which will house sporting, artistic and social events in a fabulous 3,600 m2 facility – an important milestone in the development of the school.